Great Bluefin Tuna fishing today at 140-150 miles. Some boats in the area are approaching 100 Bluefin for the day. The fish are 20 -30 pounds and the weather is beautiful. We went out on a great fishing day. Great crew on the Seaforth made us feel well taken care of. 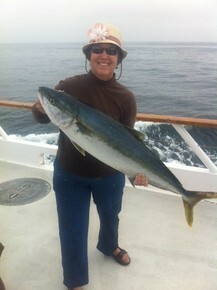 Caught some nice yellowtail.